Lutembacher syndrome is a rare form of a cardiovascular syndrome characterized by the presence of Mitral Stenosis and Atrial Septal Defect at the same time. In simple words, if a patient has both atrial septal defect and mitral stenosis at the same time then you can label such patient as a case of Lutembacher syndrome. Lutembacher syndrome is the name of the presence of both atrial septal defect and mitral stenosis in the same patient and at the same time. The cause these two conditions that is, atrial septal defect and mitral stenosis can be anything. It doesn’t matter what causes these two conditions, if these two conditions are present in a patient at the same time then this is a case of Lutembacher syndrome. The most common cause of mitral stenosis is valvular heart disease or rheumatic heart disease. Rheumatic heart disease may lead to mitral stenosis or MS can be congenital. On the other hand, the atrial septal defect can be congenital or iatrogenic. Some heart procedures can cause atrial septal defect as a complication. Or another mechanism is that mitral stenosis causes left atrial dilatation and dilatation of left atria may widen a small congenital atrial defect and make it significant. 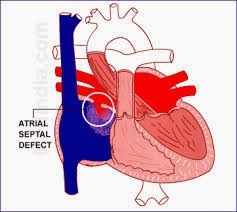 The atrial septal defect causes left to right shunting of blood, because of higher pressure in left atrium than right. From the left atrium, some of the blood enters the right atrium and remaining to the left ventricle. Thus, cardiac output tends to decrease and right ventricular workload tends to increase. Because right ventricle receives more blood as compared to the left ventricle. In the long run, right ventricle hypertrophy may occur and if defects aren’t repaired then soon signs of right ventricular failure, such as bilateral pedal oedema, hepatic congestion, ascites, and pulmonary hypertension may also start to appear. Pulmonary congestion and oedema is a late sign in case of large ASD but an early sign in case of small ASD. Why is so? This is because, in the case of large ASD, the pressure in left atrium doesn’t increase. This is because blood rapidly moves to the right atrium through the septal defect and to left ventricle thorough narrowed mitral valve, without increasing left atrial pressure. But in the case of small ASD, blood can’t move to the right atrium rapidly and due to mitral stenosis blood also can’t move rapidly to left ventricle, so when atria contract, pressure in left atrium increases considerably and backflow of blood towards lungs through pulmonary veins may occur early and this may cause pulmonary oedema and congestion. So as a conclusion of above discussion we can say that in Lutembacher syndrome there is mitral stenosis, atrial septal defect and left to right shunt. These three pathologies can lead to pulmonary congestion, right heart failure and pulmonary hypertension, if condition is not treated soon enough. Lutembacher syndrome consist of two pathologies that is mitral stenosis and atrial septal defect. Both of these pathologies need surgical repair. So percutaneous mitral balloon valvuloplasty or surgical replacement of mitral valve is needed for the correction of mitral stenosis and percutaneous transcatheter closure or open heart surgery is needed for the correction of ASD. If these two pathologies are corrected early then patient may recover without any significant after effects or complications. In Capital Hospital Islamabad, Pakistan, a case of lutembacher syndrome was reported by Dr. Farhan Ali, a 21 year old lady was presented with right cerebellar stroke and the cause was atrial fibrillation that leaded to thromboembolic phenomenon and stroke and the cause of atrial fibrillation was atrial dilatation that has occurred due to mitral stenosis (that was occurred because she suffered from rheumatic heart disease 3 years ago) and she also had a congenital atrial septal defect. So she had lutembacher syndrome as the underlying pathology (as she was suffering from both mitral stenosis and atrial septal defect). and stroke and atrial fibrillation both occurred due to the underlying lutembacher syndrome. She was managed supportively for stroke and referred for surgical repair of ASD and MS, that was done six months after and she recovered.